The ground is excavated for building the basement. These are underground structures and chances of water seeping in from the floor and the walls are very high. In the areas where the water table is high the chances of ground water incursion is high, but even in the areas where the water table is very deep, water can seep in thru the walls during rains or water leakage from the drains around the building. While the foundation and raft are in concrete, the walls could be in Concrete or Bricks. The appropriate waterproofing solutions are required depending upon the type of construction. Basement Water Proofing involves waterproofing of below the raft and waterproofing of the walls. While doing the waterproofing on the basement walls it is important to make sure proper steps and materials are done for the basement waterproofing to protect your investment. Basement waterproofing is necessary to prevent water seepage that can lead to damage and even cause mold. Its always advisable and recommended to waterproof the base of the basement before the raft is casted. While there could be many ways to do this, we prefer to use mem branes such as APP, HDPE and PVC. HDPE and PVC membranes with pressure sensitive adhesive, which forms a bond with wet concrete poured over it and becomes monolithic part of the structure. PVC membranes are more flexible. However, the product selection is done based on site and client requirements. While, waterproofing is feasible from the Negative side also, it’s always desirable that any sort of waterproofing is done from the positive side of a structure. When waterproofed from the negative side, the water may not ingress into the building, but it would have already gone inside the concrete and would damage the structure and steel inside. We use different time of products for waterproofing from positive side, such as Membranes, Crystalline, Two Component Acrylic Modified Cementitious products, Pure Polyurethane, Modified Polyurethanes etc. The application is designed as per the site requirement. While doing waterproofing from the negative side or inside the basement, its important to first check for any existing seepage or active leakage from the concrete. Waterproofing from negative side becomes very critical once the water starts flowing in. 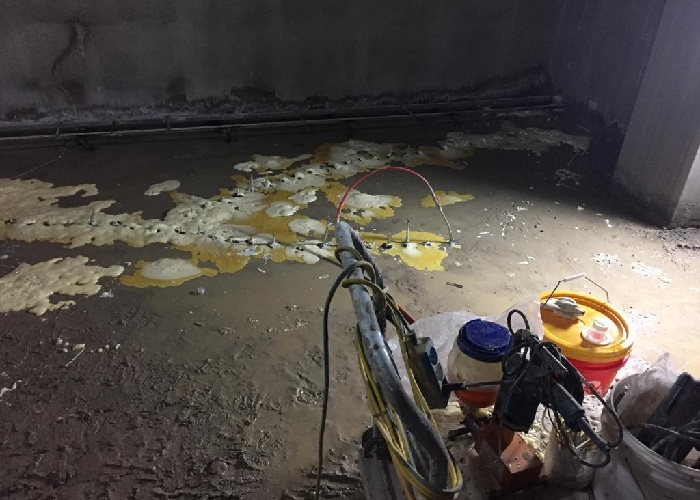 In such cases, different applications such as Injection Grouting using Polyurethane, Epoxy, Cement are used to arrest active water flowing from the walls or floor. Among the chemical coatings, the only one which can prevent water seepage is Crystalline technology-based products. However, the product selection depends upon the site conditions.